Welcome to SketchUp Australia’s tips and tricks. Tip No. 2 is all about Direct Daylight Access. Using SketchUp’s integrated shadow tool to conduct Direct Daylight Access studies. Tip No. 1 is all about Command Shortcut Keys. A shortcut key is a SketchUp command that has been assigned its own keyboard key. Getting used to shortcut keys does take a little bit of practice, but after a while you’ll find that you’re saving heaps of modelling time. 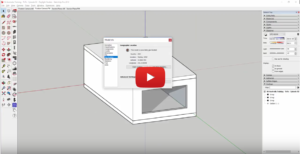 SketchUp comes preinstalled with some basic shortcuts, but we also have the option to assign our own shortcut keys to better suit our modelling needs. To demonstrate, in the video, I’ve modelled a relatively simple shape without using any shortcut keys, and then again with shortcut keys. Hopefully, the improvement in speed should be obvious. In the video you’ll find a list of shortcut keys that we use. You’ll find instructions on how to import the SketchUp preference file here. We hope you find this SketchUp Tips and Tricks video helpful. Keep checking back for more helpful hints.